JB Switchgear Solutions (Pty) Limited carefully selected 3 unemployed candidates from the Ekurhuleni Campus situated in Daveyton, which will be given the practical experience to complement their theoretical qualifications already achieved. All 3 candidates started this year at SAJ COMPTENCY CENTER in Wadeville which is a fully MERSETA accredited facility where they will undergo training in the Electrical Engineering field for a total of 120 days. Once they have successfully completed all the prescribed modules, they will be given an opportunity to gain 18 months’ of on the job training in our workshop situated in Brakpan under strict supervision. Once this phase of the training is completed, they will be subject to a 2-day trade test readiness assessment at SAJ. Should there be additional gaps identified this will be filled by supplementary training after which a trade test date will be set. Obtaining a trade test qualification is the main objective of this process and candidates will have a bright future going forward and will have very good career prospects in the industry. Our objective is to add value to the economy by producing adequately qualified artisans that will give valuable input into any organization wherever they find themselves in the future. 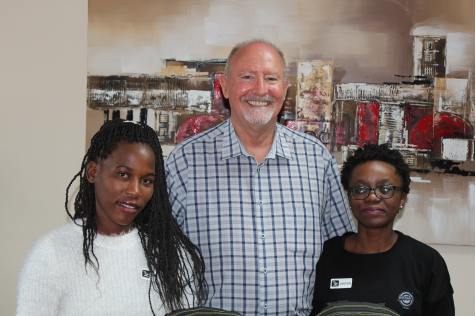 From left to right Mmabotsi Cathy Masete and Thabang Faith Selowe and the insert is Linda Twala our Managing Director Johan Basson wished the candidates luck on this exciting path.